Easily operate these retractable blade scalpels with simple movement of the thumb on one hand. Each scalpel features an integrated double safety feature to prevent accidental blade extension and injury during dissection procedures. These quality instruments are color-coded, cost-effective, and compliant with OSHA requirements. 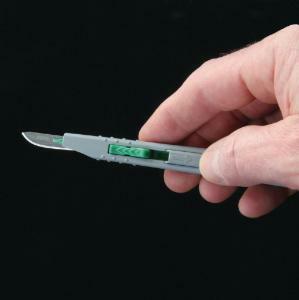 Non-sterile scalpels are designed for educational dissections.